I honestly don’t know why these aren’t mass produced in stores. I just don’t know about them? But if my friend Katherine could bank on the idea, she’d totally be rich. She was tired of her girls asking for a drink of water every two seconds and pulling new cups out of the cupboard. 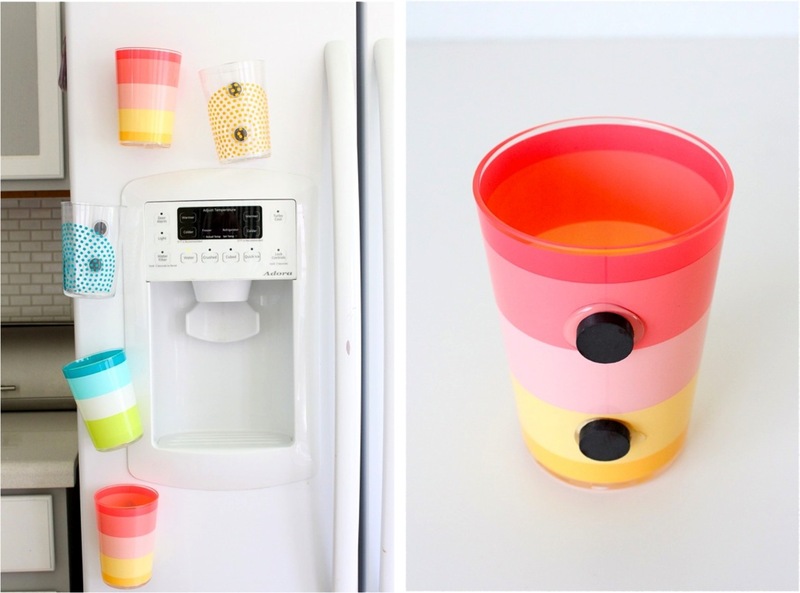 So she thought…why not make cups that stick on the fridge? They can grab a cup, get their own water, then stick it back in the same spot. Then she told me about it. And I asked if I could share the project with you guys, since our kitchen definitely needed FMCs (fridge magnet cups). • Always take precaution when using magnets around kids. I’ve seen too many stories on the news about kids swallowing magnets….which is why I went with these larger ones. • If you’re worried about kids prying the magnets off, you might try Super Glue instead of hot glue. BUT, I did a test and tried to pry off one of the dried magnets (okay, I was really trying to fix a misplaced magnet. It’s true)….and it was really hard to get off. I had to use a butter knife and applied a lot of pressure to pop that thing off. So I’m not worried about that at all. • Katherine glued her magnets to the bottom of the cups. She used tiny magnets and sealed them completely in hot glue so the kids can’t pick at them at all. Do whatever works for you. • I found that two magnets work better than just one since the cup sides are angled. • Allow about 10 minutes for the glue to dry/cool completely before sticking them on the fridge. • I’ve only hand-washed the magnet cups but I assume you could run them through the dishwasher. It is a great idea!! c’est une superbe idée!! Brilliant! How come I’ve never thought of this!?! Oh I love this. But we have the Cabinet covered fridge so now I’m thinking the magnet board handing to the side how fab!!! I was seriously thinking about do this today, too funny! The only thing I would worry about is the hot glue getting too hot again in the dishwasher and melting…not sure how hot the dishwasher gets, but I think it might be hot enough to soften them at least. I am totally pinning this idea, btw. I am tired of having 50 million cups all over my kitchen counters! I agree. There was a stick of hot glue that my hubbs thought was a straw and he put it in the dishwasher. It took a little while but it melted through our utensil holder. I bet if you did wash it in the dishwasher I would probably do top rack only and maybe not do the dry setting. Or an idea would be epoxy, not sure if that would work, but I know epoxy is forever. That or try the “high temp” hot glue!?! It’s supposed to have a higher melting temp?? I second Pippin’s idea! Right now I’m totally inspired by your two-toned cabinets. Love them! I actually copied your kitchen when we decided to reapaint our cabinets, everyone LOVES the grey and white combo. 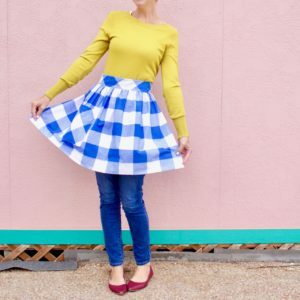 We have yellow pops everywhere for a little color. I would love to see more of your house! I’m loving that orange fabric on the chairs! LOVE it! UR friend should patent this idea cuz I think all moms would buy. 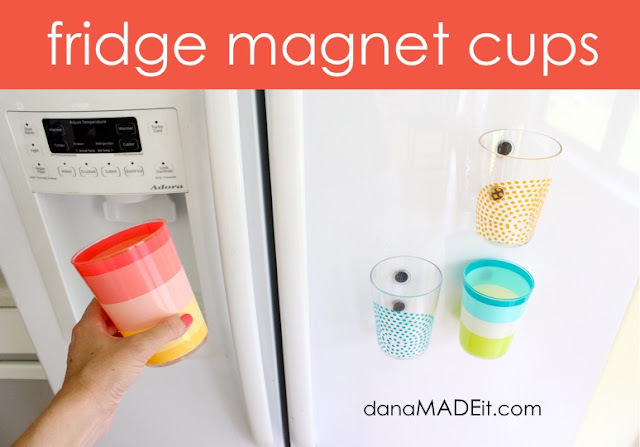 Manufacture a magnetic cup on the inside so that it’s washable and magnets can’t be pulled off. The magnets on a drink holder is already parented by my husband. Do a search and get a good patent attorney if you plan to move forward. No one says you can’t DIY. You just just can’t earn money off of it. 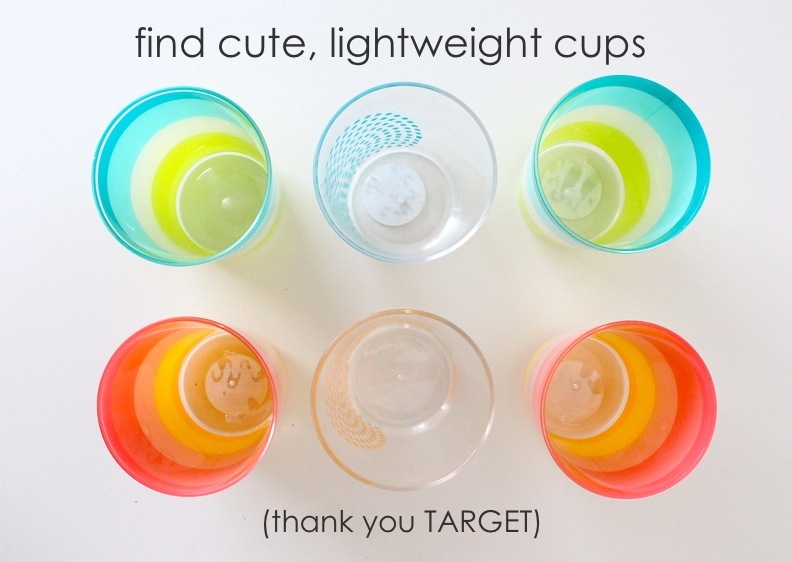 This is a great idea for kids cups. Seriously, whoa. That is the best idea I’ve seen in a long time! I’m currently 3 months pregnant with twins and already have a 3 yr old, you just SAVED. MY. LIFE!!! It never fails, the 3 yr old needs a drink as soon as I sit down! Problem solved!! THANK YOU!!! Some are magnetic on the side, any chance you’ve tried that?? A local single dad started his own line of these. 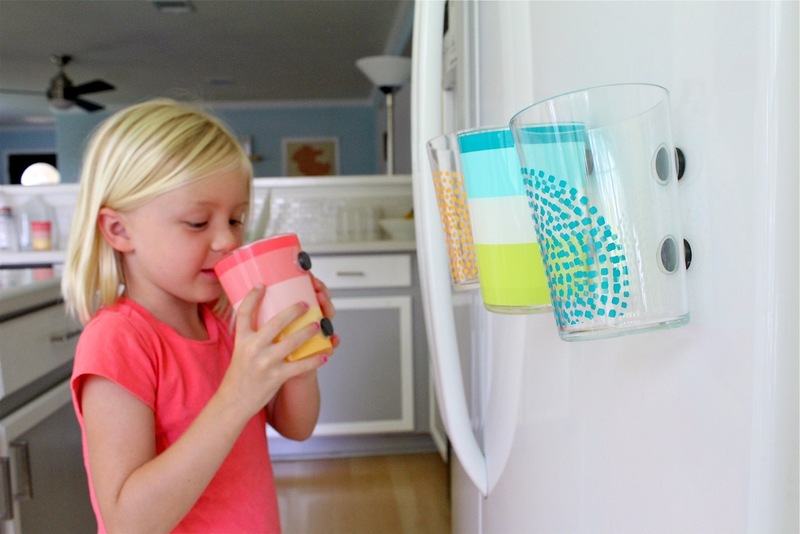 They are really cool, and the magnet is embedded in the cup so there is no way for kids to get to it. But this is a great way to do it yourself! Thanks! Oh my dang, ’tis the season, gotta do this one. freakin’ genious!! my kids do the SAME thing….one million cups a day with water! this will be FUN for him and I know he’ll love it! my little one will need help, but I know she’s gonna dig it too! BRILLIANT!!!! We are making these tomorrow!! I saw these cups at Quilted Bear (think a large boutique with lots of different sellers in a large walmart sized space). And they are an awesome idea! I saw them at the Quilted Bear too. The magnets are completely covered and dishwasher safe. I didn’t buy them because they only came in solid ie. boring) colors! Such an amazing idea!! Any thoughts on how to deal with a fridge that won’t take magnets e.g. stainless steel? is it magentic on the side? This is a life saving idea! Seriously! We go through about 19 millions cups a day – I’ve got to do this. Like, today! However- a DIY is always appreciated in this household! 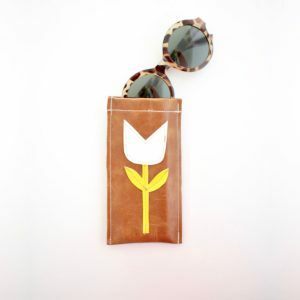 These are so much cuter! I like that the kids could potentially pick their own cup- because with my 3 if they don’t CLEARLY have their own there is tons of bickering over who gets which. This is a fabulous idea not only for kids but for adults too. I’m headed to the store tonight to get some cups. Absolutely genius. Now we need a fridge with ice and water in the door. But I think my kids can use the water filter jug thingy we have on the counter. The spout is at the bottom so all they would have to do is push it, kinda like you do with the water in the door of the fridge. This is a great and fun idea though. what a good idea! I never would have thought of this….glad you posted about it! um, how’s the cup full of water spin on (and scratch) the fridge factor? My only concern with the magnets is that they may scratch the fridge over time as they are kind of a rough cut. Maybe cover them with a circle of fabric or something? Just a thought. I worried about the magnets too but we’ve been using them for a week and haven’t noticed any scratches at all. I love this idea! Why don’t I think of things like that? Also, I love your cabinets. Mine are due for another paint job, ugh. Did you paint yours yourself? Do you have any tips? Yea, I painted our old ugly brown cabinets gray and white. I just buffed the old ones up a bit with a sanding sponge and then went for it with the gray! Neat idea! Might I suggest some Sugru? 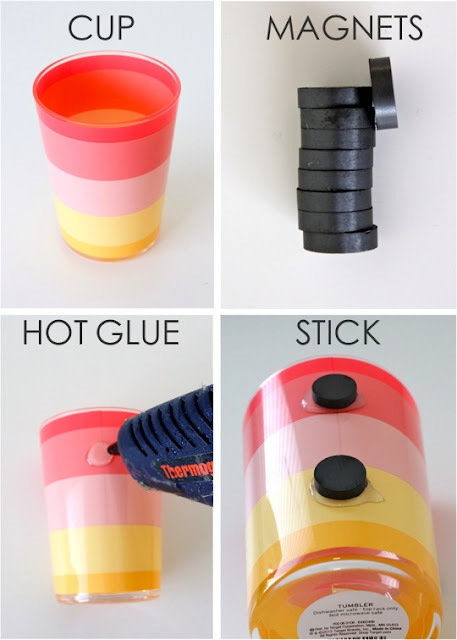 (Sugru.com) (I don’t work for them)…they had a tutorial a while back using magnets to attach drying towels to a fridge or stove. How did you know?! I have seriously trying to solve this dilemma and here is a solution! GENIUS. Thank you, thank you! P.S. Love the cups! Love it! Such a smart idea!!! Wonderful idea! We have a stainless fridge too. I wonder how this would work with Velcro dots? is it magnetic on the side? 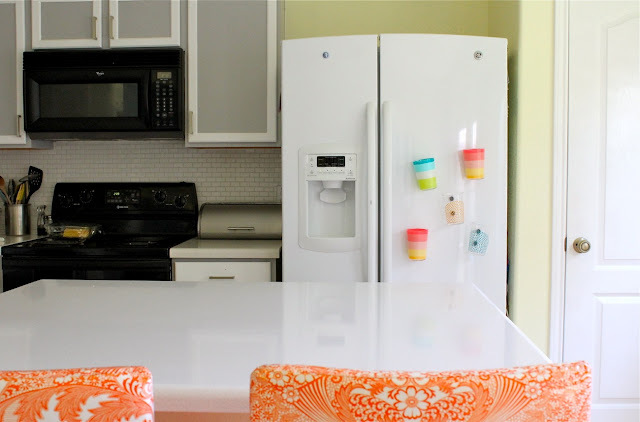 I love this idea and your kitchen! I have a friend involved with the Stick Up Cup company so I’d heard of these as well. I considered making them myself like you’ve done but I wondered how to glue the magnets on and have them last through the dishwasher. I HATE washing dishes. Has anyone actually tried them in the dishwasher? Love this idea my LO’s are always thirst and seeing this fixes my thirsty 24-7 problems :). my kids are pretty good about using one cup for the day, BUT it annoys me that they’re always on the counter!! yay! solution! so now, my only concern is that my kids don’t tend to finish drinking the water they dish out. so i could see them trying to stick them back on the fridge with water still in them! :-/ have your kids done this to you?? just curious. i guess i better just train them when we make them? awesome awesome awesome idea!!! My son still needs help getting a drink because he can’t reach the cups. That was until now! A great idea. And like many of us moms I am slapping my forehead and saying, “Duh!” I have not seen this in stores but I bet it won’t be long before someone mass markets the idea. Your friend should get her patent now!! The best thing is I have all the materials needed for this project at home, no need to shop. Oh wait is that a good thing, maybe I need new glasses just to have a reason to shop. I truthfully, as a parent, do NOT think this is a good idea. My opinion. What an awesome idea! I can’t tell you how many times I have come into my kitchen to find 12 different used cups sitting on the counter, all because no one could remember which cup they used previously and just opted to get a clean cup instead. I agree…awesome idea! You should patten it! 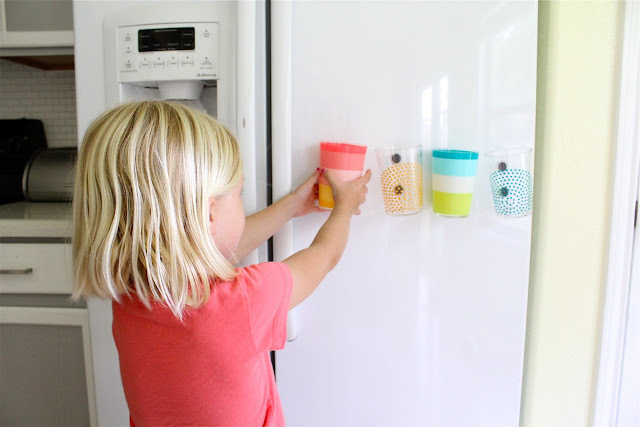 If you are worried about the magnets scratching the fridge you could put up scrapbook paper with tape or magnets under where you will keep the cups. Or you could put up contact paper in that area. Just a thought! 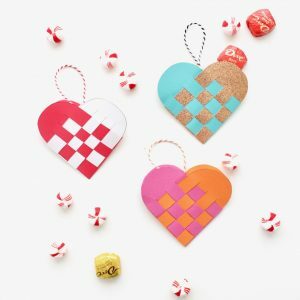 You could even use chalkboard contact paper to make it more fun. Very cute, very clever, very stupid. Microorganisms grow on used cups and plates and anything else that comes into contact with food if they are left out, unwashed, for four hours or longer. Instead, skip the magnet and have your children put their cups IN the refrigerator. Otherwise, you have the perfect conditions to make your child good and sick. Are you kidding me?! There is no way my kids are using four cups a day ON PURPOSE when all they had in them was water. I have never, ever heard of anyone getting sick from using the same water glass all day for ONE DAY. you are a flipping genius. I use to have a problem with too many cups floating around my house with my four kids so I designed what I wanted from a cup and came up with a new product called the MyColourCup. The cups change names. So just need to grab any cup from cupboard and change it to your name. Place on mat to reuse throughout the day. Unbelievable. Many kids die or are rushed to the hospital every year from swallowing magnets. These magnets are NOT too big to be swallowed. This is an extremely irresponsible article. What if only one of your readers has to take one of their kids to the doctor because of this? I love it! It’s so cool. I absolutely love this idea and finally did it today! Can’t wait for the kids to try them out. Thanks so much! This is such a wonderful idea! My son goes through many cups in a day. Great idea! For those that are worried about the round magnets with little kids, you could also use magnetic tape. It’s sticky on one side, but I’d still probably use hot glue to attach it to the cup. About a 2 inch vertical strip on the cup should hold it. This is an awesome idea. To the lady that claimed her husband already patented the idea, he needs to do more advertising ! 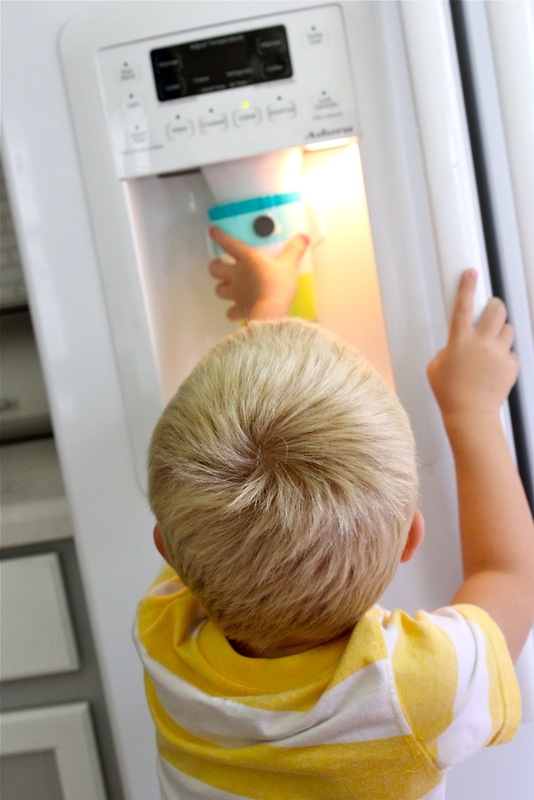 If you do not have a metal refrigerator, you could try using velcro. I doubt they will hold up in the dishwasher though. Thanks for sharing!!! You don’t hang it back up with water in it. The water gets drinken and the empty cup gets hung up. Tell your readers to be VERY careful of magnets. I would avoid pairing magnets and eating implements unless done professionally by someone aware of child safety standards. Also bear in mind that glue can weaken over time especially with regular washing. 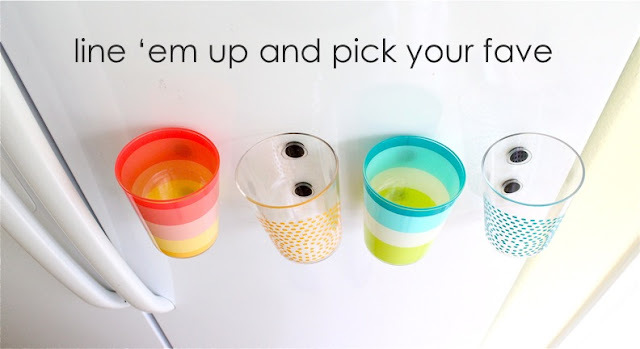 Yours is a fantastic idea to prevent washing numerous water glasses daily by assigning one unique easily identified reuseable cup for each family member!!! The cups could simply be placed on the counter right beside the fridge (rather than using magnets that could become a hazard). This idea is nothing other than genius. SO doing this to save me from headaches when the younger ones come to visit.